If im honest, im not the hugest fan of soups - but I knew I had to have a go at some, and so this one was born from throwing all my favorite ingredients in a pot, and I love it!! In this I use Italian Sausage meat, Kale & Red potatoes (potatoes cooked separately to avoid making the soup too starchy) - these are 3 of my fav ingredients! Sausage meat has so much flavor, Kale has so much goodness, and red potatoes hold their shape well in soups. Get sausage meat & onion frying in olive oil, in a large pot - season with salt, pepper & herbs. 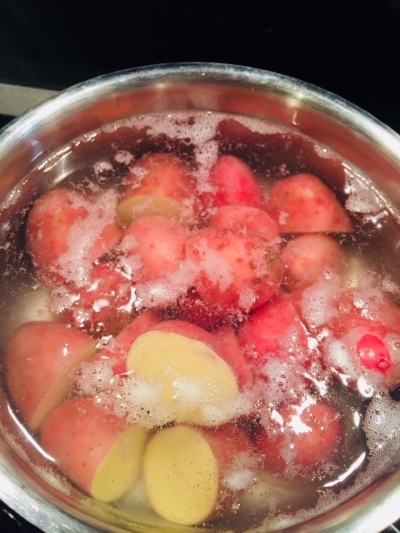 While browning meat, get potatoes (halved) on the boil in a medium pot of water - boil these till almost soft when poked with fork about 10-15 min: this way they're easy to cut into soup at end for last 10 minutes cooking. *This soup is gorgeous heated up the next day for leftovers!